What it’s about: Trying to describe what J. R. is about is like trying to describe capitalism or the neural pathways of the mind. It’s not a story about one person, per se, or even the story of many people. It’s more the story of a collective. This is because J. R. is almost entirely written in unattributed dialogue. There are no breaks in time and almost no narration to show place change. The reader’s vantage point could be likened to a flea traveling on the back of a man on his way to work, then jumping onto his secretary’s desk, then leaving in the pocket of a delivery man. The flea would be privy to overheard conversations, but he’d have no background material to provide context to what he heard. He’d only hear one half of phone calls and he’d enter into many exchanges in medias res. If he traveled around in pockets for several days and targeted a specific cast of ten to twenty regulars, he could perhaps put J. R. together. But he’d never capture voice or nuance of character as well as Gaddis has managed. 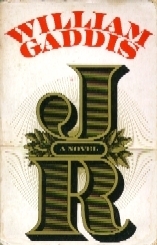 The book is truly astonishing in that Gaddis not only holds up his conceit, he makes it an art form and a commentary on society in itself. His dialogue is full of interruptions and forces us to consider the pace of interaction today and how often we misunderstand one another through simple lack of attention. The characters speak over one another, often missing the true substance of the conversation as they focus only on their own concerns. Some sections are devastatingly funny while others are heartbreakingly sad. Nominally at the center of this 726-page epic is J. R., an eleven-year-old entrepreneur with a penchant for penny stocks and tax right-offs. With only a superficial understanding of the stock exchange and some literature he’s sent away for, he starts to build an alarmingly large business empire. He ropes in the unwitting Edward Bast, a young would-be composer who agrees to represent J. R. in a few business deals. Suddenly Bast finds himself as the right hand man and also the only one in the company to know J. R.’s true identity. Around these two bubbling businessmen is a varied cast of character, from a big game hunter with plans to ship caribou to Kansas to a crack-pot scientist bent on freezing shards of sound. Would I recommend? J. R. is not a book for the faint of heart. It’s epic in length and scope. But it’s also kind of genius. It’s a completely different form, one I’ve never seen before, and Gaddis is a master of the human dialogue. It’s funny and sad, but should not be undertaken lightly. If you consider yourself to be the literary type, you should give this one a try. If The Hunger Games is more your cup of tea (and I maintain there’s absolutely nothing wrong with that, since I loved that book too), J. R. probably isn’t for you.